I have always loved history in the laziest way possible. I love the stories, and the complicated way stories cross and influence each other, and I love puzzling over why people did what they did and how the consequences still play out today. The older and more mysterious, the better. Plus I’m a sucker for narcissism: How does this affect me? Thus, I’ve been gobbling up Saudi history since I’ve been here—big ponderous books I never would’ve cracked before I found myself in the middle of a culture I didn’t understand. After all, you have to study the history before you can understand something, right? Now, don’t ask me to keep the names and dates straight—my brain is not equipped for data retention. Took me six months to learn my Saudi phone number. So imagine how thrilled I was to learn that you can see prehistoric art in caves near one of our destinations in Spain this October. (The correct answer is “real thrilled,” in case you have a weak imagination.) Now THAT’S old and mysterious. Who were these people? What purpose did the art serve? How did they use the caves? What were their lives like? 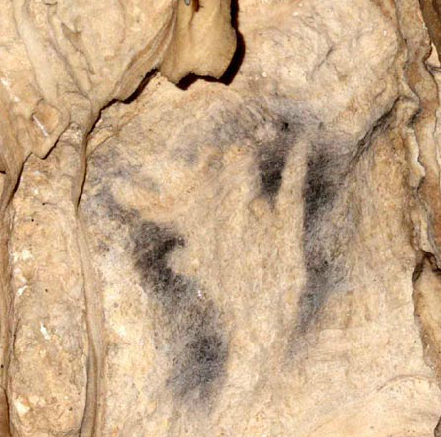 The cave has line drawings of animals and hunting scenes as well, but this handprint fascinates me. It’s a negative image, made the same way you’d adhere a leaf image to a glass jar and then spray color around it. 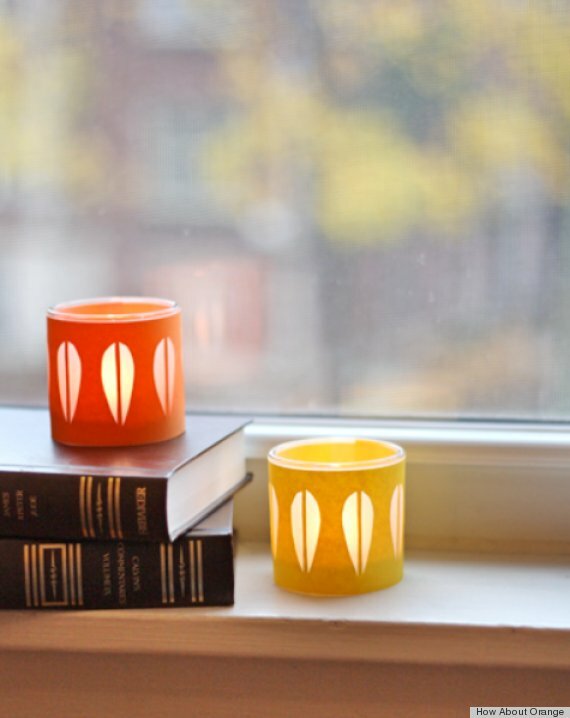 An autumn votive wonderland! Yes, from me you get a craft blog for free. But back to the people who had a little less disposable time than Martha Stewart and did this stuff anyway. In the hand print, the index finger is raised and bent so that only the fingertip blocks the paint. The little finger is also bent outward. Why? No one knows. But these “primitive” people had not only figured out how to make a liquid pigment out of the raw oxides around them, they’d discovered how to use capillary action to blow across the top of one straw with another, atomizing the pigment and distributing it like spray paint. Drop me, empty-handed, into that landscape, and how long would it take me to work all that out? Until never. Clearly, these people valued others’ discoveries, shared them, and all moved forward because of it. Hey look! A house. People still living here, 20,000 years later. What do you think the odds are that the family living in that house is related to the people who walked through this cave 20,000, or 10,000, or 5,000 years ago? It’s been proven before: DNA taken from 12,000- and 9,000-year-old remains in an English cave showed maternal relationship to three people currently living in the nearby village, so it’s not unreasonable to imagine the same thing playing out in Spain. The particular strand of mitochondrial DNA found in the English case is found in approximately 10% of Europeans, so…yeah. We all family here. Okay, now it’s time for the narcissism. My maiden surname is Dutch, and according to information I stumbled upon in some distant cousin’s website years ago, can be traced in Holland back to the 1500s, and evidence (that I never looked into myself) suggested that at about that point it may have come from…Andalusia. BACK. UP. Given the way European DNA spreads all over the place (and I’m a European hodgepodge), there’s a not-remote chance I was walking around on the footprints of some progenitor of mine. But I could see. And I could feel. And I could step outside and see the flow of the landscape and be grateful that these things were still here, protected in their place, for me to see and wonder about. To humble me. I appreciate that all the more because I live in Saudi Arabia, where historic preservation cannot be taken for granted. Saudi culture doesn’t place visible value on history. In the wake of our desert trip a year ago to explore ruins (the account is here), every man in that group, in subsequent workplace conversations about what people had done over the weekend, had Saudi coworkers say, essentially, “Why’d you want to do that?” Old stuff is junk. Old Arabia was poor and dirty and its people had nothing. New Saudi Arabia is rich and its people have maids and drivers and glittery chandeliers and big, shiny malls. Even in Mecca, the holy city, the Prophet’s birthplace, buildings from his lifetime and beautiful Ottoman structures have been bulldozed to make way for malls and hotels. Saudi schools teach Islamic history—Mohammed, his life, his family, his conquests, his followers and enemies, the caliphs. And they teach Saudi history. That’s it. Teacher friends at area universities share stories of Saudi girls with next to no awareness of the outside world. My husband’s coworker, an intelligent man with an expensive private education, said the only history he was taught was of the Kingdom of Saud, starting with Abdul-Aziz at the beginning of the 20th century. When they traveled to Cairo together on business, he had no interest in seeing the Pyramids. Why should he? The idea that the past has something to teach us is not universal. If what happens is all according to the will of God, what point is there in looking to the actions of other mortals to inform decisions? It is only in the last year that a searchable database of legal precedent has come into existence in Saudi Arabia. Saudi judges (all religious clerics, not lawyers or legal scholars) have historically made their rulings in isolation. If your neighbor accused you of, say, leaping the wall and taking unauthorized dips in his pool, the penalty could be, essentially, anything, depending on the whim of the judge who happened to hear your case. His ruling is only a reflection of the will of God, no matter how far astray from similar cases that ruling might be. The Western obsession with fairness is a fool’s errand. The world—which operates according to God’s will—is inherently unfair. Humble yourself, accept it, and praise God. They’ve had problems with Saudi men shooting the heads off carved figures, presumably because they’re not Islamic. Or at the very least, not important. In undeveloped areas near there you can just walk around and pick up artifacts off the ground. Nobody studying them, nobody preserving them. I try to imagine what my worldview would be like if I hadn’t been taught and re-taught about Mesopotamia, about Egypt and the pharaohs, the Greek philosophers, the Roman empire, the Chinese dynasties, the rise of Islam, the Crusades, the Ottoman empire, Marco Polo, Christopher Columbus, the Protestant reformation and the Renaissance, global colonialism, the Enlightenment, the American revolution, the world wars, the Cold War, the ebb and flow of global commerce. The roots of conflict here and there, the track records of different types of government, the fallouts of conquest and defeat. The power of narrative to tie things together (even if you’re fuzzy on those names and dates). If I didn’t have any context for my own place in the sea of humanity. If everybody else in the world was just, kinda, out there and meaningless. At the very least, I imagine I’d find myself to be pretty darned important. Pretty consistently right. Everybody else, basically, in my way. I’d be more inclined to think the whole world just needed to get on board and line up with me, understand me, accommodate me, quit ignorantly suggesting that anything I do could possibly be weird. I’d be angry, even, with those who foolishly obstructed me. And I’d have a freaking hard time learning anything new as long as I put no value in what anybody else thought or discovered. In fact, I’d expect the entire world to think about me in exactly the same way I think about myself. Because, gosh, what other way is there? Of course, I’m just guessing, here. Total hypothetical. I mean, how could I imagine a life I wasn’t already living? 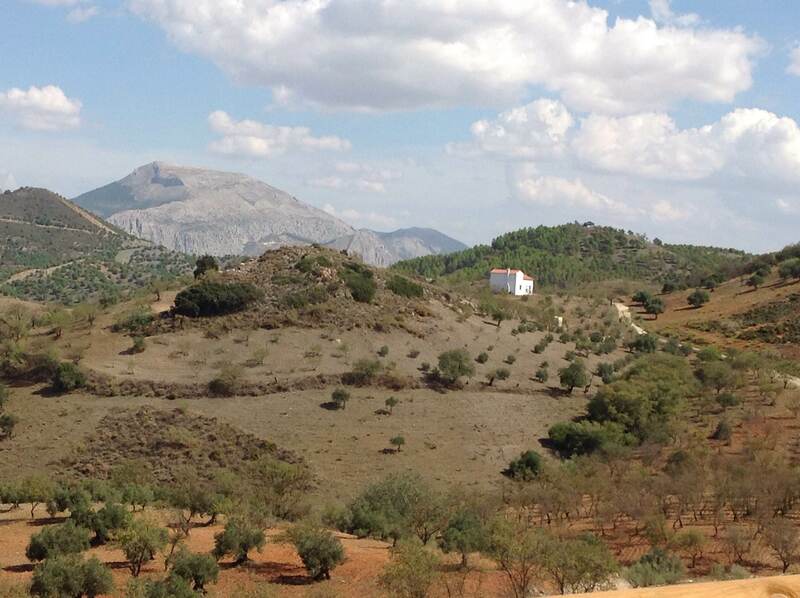 The website for the Cuevas de Dona Trinidad in Ardales is here. It’s in Spanish only, but to see pictures you can start here and click through the arrows just below the map to see more of the art. It’s hard to see clearly in the pictures–when we were touring the guide showed us diagrams of each drawing or etching that made it easier to make sense out of a fairly faint image. If you’re in the neighborhood, don’t miss it. 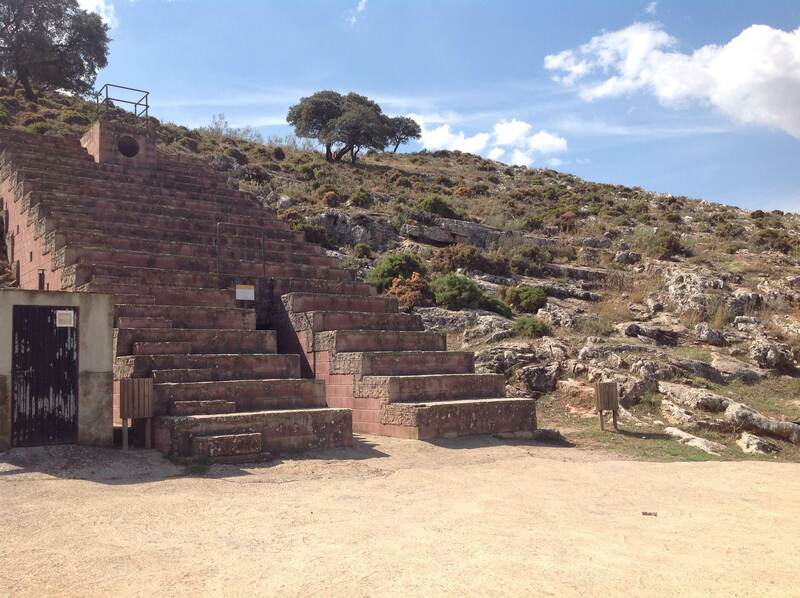 You can arrange for tours (in Spanish) by emailing prehistoriaardales@guadalteba.com. And if you’re just into this kind of stuff, find and watch the movie Cave of Forgotten Dreams, which takes you into the astonishing Chauvet caves of Southern France. Beaut study of our links from past to present, of culture and history, of understanding from different points of view Margo. Of continuity and changes. I thought you (and your readers) might enjoy this presentation about poetry in the Arabian Peninsula that I came upon recently. Nabati poetry has been a feature of life in the Arabian Peninsula since the 16th century. In certain eras, this poetry was the only record of historical events. Historians only know of these events because the Nabati poems have been passed down through generations. Nabati poetry shows the natural creativity of the Gulf’s inhabitants and represents their roots in this land. It is their everyday dialect. A strong dialect, slightly removed from classical Arabic. It should be studied so that it may be preserved. Nabati poetry is also known as “the people’s poetry” and “Bedouin poetry”. It is considered the richest form of popular literature, and seen to reflect the reality of everyday life. Nabati poetry is a great literary treasure, and a phenomenon unique to the Arabian Peninsula. Its form and content, literary significance, social function and historical value also make it a unique style of poetry. It is the document on which one can catch a glimpse of the past, or even get a more precise idea of historical customs. It depicts the situations faced by the countries of the Gulf and the Arabian Peninsula before their modern-day renaissance. Why is it called ‘Nabati’ poetry? There are several theories about where the name ‘Nabati poetry’ came from. One suggestion is that this style of poetry originated in a place near Medina, called Nabat. Another reason that has been put forward is that when the Arabs first began to interact with other cultures and nationalities, certain words and linguistic traits were assimilated into classical Arabic to create a new form of Arabic. The people who spoke this style of Arabic, embellished with foreign vocabulary, were said to be speaking ‘Nabati’, which, in this sense, meant ‘foreign’. A more popular theory is that Nabati poetry came from an ancient Arabic tribe called the Nabateans, who, between 200 BCE and 600 CE, established a considerable empire in the Fertile Crescent, with Petra, in Jordan, as its capital. They spoke a dialect of Arabic, and later adopted Aramaic. This theory does not, however, stand up to closer scrutiny. Nabati poetry is known to be the unique style of poets from the Arabian Peninsula, who are descended from known Arabic tribes. There is no known link between the Nabateans and any of these tribes. Besides this, no history book about the Nabateans, no matter how comprehensively it covers their culture and heritage, ever mentioned Nabati poetry. The most likely theory is that the term ‘Nabati’ comes from the Arabic word ‘nabat’, meaning ‘to derive from’ or ‘to obtain the sense of one word from another word’. Also, in classical Arabic, one says, for example, ‘to derive water’, to mean extracting water from the ground. When the nomadic tribes of Arabia began to emigrate from their native lands, their language also changed. It shifted slightly away from classical Arabic to become a tribal dialect. Naturally, their poetry adopted this derived dialect, hence it became known as Nabati poetry. Perhaps the most noteworthy characteristic of Nabati poetry is its spontaneity. Its composition is usually direct and unfaltering. This is not to say that it is of a poorer quality than classical Arabic poetry, or that the verses are composed in a rush, without consideration. It simply means that Nabati poets sought to create a simple style, combining artistic flair with clear, direct expression. The characteristics of the verse reflect those of the Bedouins of long ago. The poetry has been passed down through the generations in the same oral manner as in ancient times. Its success and survival is assured because of the simplicity and spontaneity of its style. Nabati poetry deals with all the subjects addressed by classical Arabic poetry. They include the following: Chivalry – Chivalry is very important in Nabati poetry. The poems on chivalry comprise its largest body of work dedicated to a particular subject. Most Nabati poets begin their poetic experience by composing a poem on chivalry. Pride and Exaltation – After chivalry, this is the next subject most commonly tackled in Nabati poetry. Bedouin life is centered on the work of the tribe. A true Bedouin cannot travel, live, or defend himself alone, and would not wish to. Loyalty and devotion to his tribe and the desire for unity are vital attributes for a Bedouin. When the poets address pride and exaltation, it is to express their pride in, and exalt, their people, not themselves. The poets call for harmony amongst people. Eulogy – In Nabati poetry, the eulogy is characterized by praise and exaggeration, that is to say the poet exaggerates his narration of a person’s actions. This has acted as an inspiration for many Bedouin chiefs and princes, pushing them to achieve great things in the hope that they will be immortalized in verse and in the memory of their people. Satire – The alter ego of the eulogy. One can find examples of satire in Nabati poetry, but they are very rare. Advice and Wisdom – Consultation and advice is an important facet of Bedouin life. It is said that, in the past, Bedouins would happily exchange a camel for a piece of good advice. The Nabati poet gives advice to society as a whole through his personal experience. Society – Naturally, the poet suffers the same everyday problems as the rest of the society. Through his verse, he can outline rights and wrongs, and discourage greed, cowardice and other faults. Description – The passion of Nabati poets for nature, and particularly the sands and dunes of the desert, stimulates their fertile imaginations. Thanks to the richness of their vocabulary, they are capable of portraying a tableau in precise detail. Those who hear a recital of descriptive Nabati verse can imagine themselves transported to the very place depicted by the poet. Proverbs – Proverbs are contained in most Nabati poems, especially those of the greatest poets, who wish to reinforce the meaning of their words with the colorful imagery of popular wisdom. Narrative – The narrative poem has always been part of Nabati poetry. The inherent style of Nabati lends itself perfectly to storytelling, with the poet as narrator. Much of what historians know of past events in the Arabian Peninsula has been learned through narrative Nabati poems. Riddles – Riddles have been regarded as a separate genre of Nabati poetry since its origin. Almost all Nabati poets have composed this form of verse at some time. Sheikh Mohammed is a renowned riddle writer, whose riddles attract responses from throughout the world. Pastiche – A pastiche imitates the style of another poet, by echoing the theme, structure and vocabulary of the original. It is usually created to show the composer’s admiration for the poet being imitated, and to showcase his technical ability. Good heavens, this is fascinating. Thank you!